Welcome to our cosy guest house Vinden which is located on the picturesque coast of the Baltic Sea. Here you will be able not only to have a break from your routine, enjoy natural beauty of the region and breathe fresh sea air, but also do some active sport. 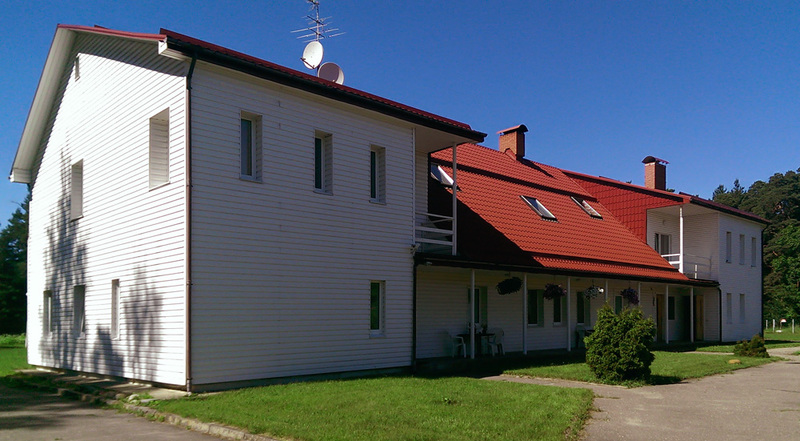 The guest house is situated 45 km from Riga. You can get here by car, public transport ( railway station "Pabaži' is located 10 minutes away on foot). Next to us in a walking distance, there is a summer cafe. You can visit Bicycle Museum which is also situated in Saulkrasti. The guest house has its own area, access to the sea (50 metres) and a free car parking for our guests. Surrounded pine trees create relaxing and romantic atmosphere. All rooms are cosy and comfortable with exquisite design and style. Every room has a shower, toilet, TV, Wi-Fi, fridge, teapot, etc. For your convenience, we have a double/ twin rooms, triple rooms and quadruple rooms. Upon request it's possible to add an additional bed in a room. cots/ child's beds are available. For our guests, we have a large fully-equipped kitchen. Guests can use a cooker, oven, microwave, toaster, fridge, child's chair and all necessary utensils and cutlery. Next to the kitchen there is a lounge with fireplace, TV, DVD and CD player, where you can enjoy your meal or spend time with your friends. If you have a more important event, then we offer a banquet room with a separate fully-equipped kitchen, fridge, cooker, microwave, toilet, TV and CD player. The entrance is separate. This room is meant for approximately 20 people. Our guests can use Wi-Fi for free, sing karaoke songs and do some other interesting activities. For the smallest guests there is a playground with a swing and slide. Parents can use picnic tables, brazier and grill. You can also get beach chairs here. If you plan to organise a family event, spend lovely time with your friends or family, go for a walk in a pine forest, see wonderful sunsets and sunrises, then guest house 'Vinden' is the best place for you.